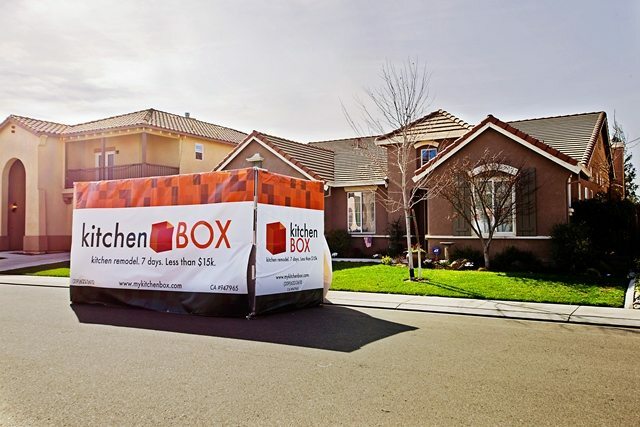 The kitchenBOX team is excited to bring our 7-day, $15,000 kitchen remodel concept to Turlock, CA! This 2005 kitchen is ideal for kitchenBOX: the owner loves the layout but needs a completely “new” look. And that’s just what kitchenBOX delivers. Like most kitchenBOX clients, this homeowner was looking for a kitchen renovation that didn’t break the bank nor cause them to live as nomads for months at a time. After seeing kitchenBOX profiled in the Central Valley Business Journal, they gave us a call and started the path to kitchenBOX. Just over a month later our team was hard at work tearing out the countertops and preparing for the cabinet refinishing. The kitchenBOX Bradley Avenue project includes one major add-on: the kitchenBOX team will be painting the adjacent living room, hall, and dinette area with Glidden’s Tawny Birch in an eggshell finish. Items like this are often added to the kitchenBOX scope in order to maximize the owner’s satisfaction without adding significant time or cost to the project. We’re already there, so we like to customize the project as much as we can! The kitchenBOX team began the transformation on Monday, March 18th, 2013. On day 1 the kitchenBOX team set the kitchenBOX, installed plastic walls for dust/fume protection, protected the tile flooring, removed the old appliances, demolished the countertops and backsplash, repaired the counter sub-top, removed the doors and drawers for off-site painting, templated for the new granite tops and prepared the remaining cabinet boxes for prime and paint. Refinish the cabinets, doors, and drawers in Kelly-Moore Brittany Beige finish using a top-of-the-line Kelly-Moore Dura-Poxy paint and primer. Fabricate and install New Venetian Gold Granite countertops. Supply and install 3×6 Travertine tile with cream-tones on the backsplash and accent it with a 3″ strip of 1×1 Mosaic tile. All of this will be grouted together using Laticrete Butter Cream grout. Install a new double-equal Moen Stainless Steel Sink. Install a new Moen faucet with a satin nickle finish. Supply and install new almond decor light switches and electrical outlets. Check back in just a few weeks to marvel at the finished product! Want to learn how kitchenBOX can help you? Just click here to schedule your phone consultation using our online scheduling system. Or feel free to call us direct during business hours at (888) 995-7996!